There is, famously, a character in Chinese that includes both crisis and opportunity. I wish activists more often thought that way and planned accordingly. 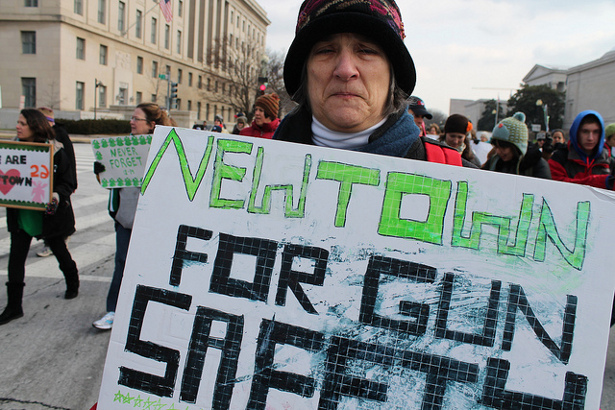 As disappointing as the U.S. Senate’s vote against stronger gun laws was last week, the fact remains that all of us can learn something valuable from the result of that hard-fought campaign — we who care about climate justice, peace and other causes. The set-up for the big day in Congress looked promising. Even though the gun legislation that reached the floor was a very minimal reform, it had the backing of the majority party and 90 percent of the population, led by the fierce advocacy of President Obama. It was, however, still beaten back by the power of money. What was missing? Conventional wisdom said that there wasn’t enough passion. Several pundits and even some gun-control activists pointed to the passion of the gun-rights movement and said that a minority’s strength of conviction trumps a large majority who feel less strongly. I doubt, though, that there really was lack of passion on the gun control side, especially in the wake of recent massacres. Some of the survivors wept in the Senate gallery as the vote was taken. I see a lot of passion — but not a lot of mobilization of that passion into nonviolent direct action, the people power that can beat money power. I remember being arrested in the Senate gallery during an escalation of the Vietnam War, in what grew into a mass mobilization of people power that helped force the U.S. Empire out of Indochina. Our civil disobedience was stimulated by the escalation and the crisis atmosphere it provoked. Some issues, it is true, don’t lend themselves to periodic crises. For example, health care crises happen on a micro-level: children missing life chances because of inadequate care, families losing their homes to catastrophic illnesses, unnecessary deaths. Crisis needs to be experienced on a collective level in order for the victims to recognize themselves as part of a large group and for those not immediately hurt to pay attention and respond. The health reform movement of 2007 and 2008, nevertheless, grew from a recognition that the window of opportunity for the issue was opening. This window does open at intervals in our country. The mainstream coalition mobilized, but it failed to switch its tactics and continued with the same-old rallies and lobbying and petitions and advertising. The coalition confined itself to turf on which its opponents could easily overpower it. And so, even with the president fighting on its side, it won little. Other issues, however, do emerge in predictable crises. Gun control is one; we can expect future massacres. Climate change is another; Hurricane Sandy is only the latest of a series that will likely get worse. School closings are another; cities in which they haven’t happened yet can expect them because the 1 percent decided years ago on a strategy of privatization. Peace is another issue that lends itself to crises; the military-industrial complex can’t retain its viability without at least one war or terrorist crisis going on. Nothing is more predictable than that another threat or humanitarian crisis will be found to justify a new war. In each case, we should ask ourselves: Are we ready to dance with history? I like this metaphor because it helps us to see that activism is not all about ourselves. We’re most powerful when we see that we’re part of a system, rather than a morality play in which we one-up other activists as not being sufficiently moral or pure or politically correct. Our job is not competing with others or chasing what’s trendy in the culture of self-identified activists. Our relevance depends on our relationship to history and whether we can learn to dance with it. I admit that I find something admirable in the decisions some make to ignore history in order to maintain the integrity of their own stance: cultivating their garden or doing war tax resistance no matter what. I’m stubborn, too. Sometimes history even vindicates them, but usually it ignores them as much as they ignore it. How do you dance with history? The dance includes at least four moves. First, create a vision for an alternative that can be proposed in the emergency. Take the General Motors crash in 2008, a predictable event. If the environmentalist movement had been ready, what a great opportunity that would have been to fight for the conversion of GM to the manufacture of sustainability infrastructure: solar panels, windmills, off-shore ships that use differential temperatures in ocean water to generate electricity and so forth. “Let’s catch up with Germany” might have been the populist slogan. President Obama was ready to put massive government money into GM. The United Auto Workers had a huge stake in an outcome that would save their members’ jobs, and it could have gotten AFL-CIO support for such a demand. In the crisis atmosphere, liberal heavy-hitters could have added their muscle as allies, though leadership would need to come from more radical sources, including environmentalists. Which takes us to the other moves. Build a bandwagon so that others can hop on it when the crisis comes. That means organizing action groups and connecting them up so they can act together when the time comes. It also means connecting with what Martin Luther King, Jr., called “people of good will” who are not self-identified activists but who will join the movement in a crisis (if the social network exists to reach them). In the civil rights movement, which was expert at using crises as opportunity, the social network was provided mainly by churches. Other networks exist, too. Some activists are hesitant to talk with people who aren’t aware of in-group codes generated on the radical margins and feel superior to the rest of the 99 percent. Other activists are visionaries who aren’t gregarious enough to turn strangers into friends. Those activists don’t need to turn themselves inside-out to become community organizers, but they do need to support others to do what they themselves cannot do in a division of labor. The third move needed for dancing with history is to build campaigns. That’s the most efficient way to learn what does and doesn’t work. A campaign has a clear and achievable objective and an identifiable opponent who can yield what you demand. It’s astonishing, in contrast, how little is learned from feel-good (or feel-tough) activities with vague goals. The fourth move is to shift tactics to ones that are more powerful and coercive. That’s what the environmental movements in several countries did with their campaigns to force an end to building nuclear power plants. They did enough visioning to offer alternatives; they created a broad organizational infrastructure that people could join; they built campaigns with specific objectives; finally, they used nonviolent direct action and rarely confused the issue (or their constituency) with property destruction or battles with police. Because of this, in the United States, an intimidating coalition of 1 percent–owned entities — utilities, manufacturers, construction companies, banks, state governments and federal agencies — was defeated by a grassroots, decentralized movement. These gains were won partly because the meltdown at Pennsylvania’s Three Mile Island nuclear plant provided a crisis, and the movement danced with it. These days, environmentalists once again seem poised on the brink of dancing with history — although affection for Democrat-approved conventional tactics that rarely work is still strong. I hope last week’s defeat of modest (and inadequate) gun-control legislation will be the coffee they can smell. In the meantime, the rest of us can start sharpening up our dance moves. Thanks again, George, for putting these steps online. Hopefully others can find them of practical use.